Telling a story is like painting a picture, using words instead of paint. 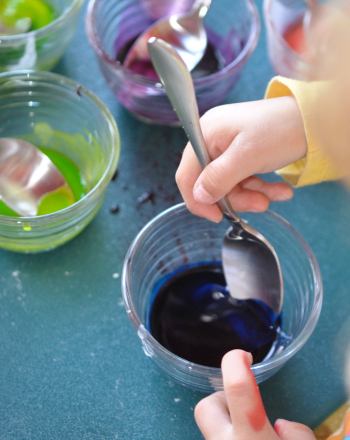 In this cooler-than-average writing activity, your child uses paint and words to write a story! Well, not actual paint, but paint samples. Paint samples often have unique and interesting names such as Western Sand, Beach Basket, and Mermaid Tear. These names make the perfect story-starters to inspire creative storytelling. He may already be picturing a California beach picnic interrupted by a crying mermaid—what a story! Have your child pick five color samples with interesting names that he thinks he'll be able to use together in a story. Or, to make things interesting, urge him to pick random samples without looking at the names. If he comes across words in the samples that he doesn’t know (for example: pinafore), have him use the dictionary to look up word meanings. Next, he should think about how he'd link the five paint chip color names into a story. For example, if he picked the five names of Madeleine, Skating Pond, Lavender Lipstick, Mother of Pearl, and Hatband, he'll need to think of a story that would use all of these words. You may suggest that he starts by writing one paragraph that incorporates each word. For example, the first paragraph could introduce a character “Madeleine”; Madeleine might visit a skating pond in paragraph two; she loses her lavender lipstick in the third paragraph; a friend remembers losing a mother of pearl ring in paragraph four; a girl with a hatband finds the lipstick in the fifth paragraph. Remind your child to make sure the paragraphs link together as a story. Finally, have him glue the color samples next to paragraphs to “illustrate” the story and give the pages some color! Once the story is finished, your young author may wish to read the story aloud to you. Recognize his creative efforts, and point out particularly descriptive language, commend new vocabulary, and discuss the all-around creativity of his story. Practice storytelling and illustration skills with this two-part adventure! Your young writer can practice his storytelling skills with this character development worksheet, where he'll outline 4 fictional characters. Students can practice finding transition words using a sample text about the popularity of soccer that’s chock full of transitions. After looking at a sample model, write a division sentence to represent each drawing. This sample nonfiction text about basketball helps students to explore author's point of view. Use this fun revising strategy to revise a sample essay. 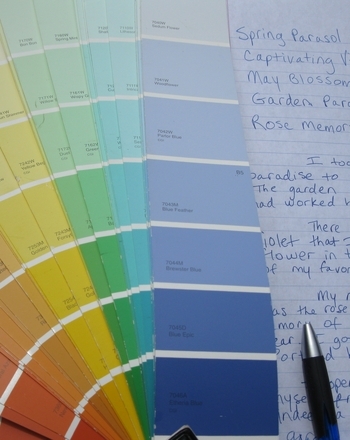 Students will use this fun and colorful revision technique to edit a piece of sample writing.